The jumbo was filmed playing the mouth organ at a rejuvenation camp for temple elephants in Coimbatore's Thekkampatti, reports news agency ANI. New Delhi: Consider your day made. A delightful video posted on Twitter by news agency ANI shows a very talented elephant play the mouth organ, or harmonica. 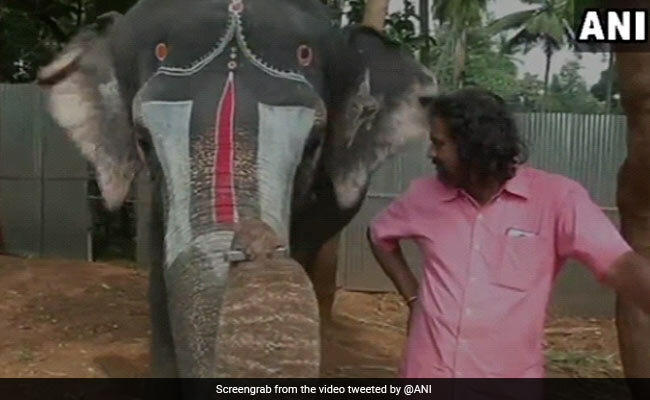 According to ANI, the elephant named Andaal was filmed playing the mouth organ in Coimbatore's Thekkampatti. The jumbo musician is at a rejuvenation camp for temple elephants. Our only complaint? This video is far too short. More music, please! The footage shows the beautifully adorned temple elephant holding the harmonica in its trunk and blowing with all its might. A man, presumably the mahout, looks on proudly as Andaal toots a few notes. Music to his (and our) ears! Finally, he takes the mouth organ from the elephant and gives the skilled jumbo a rewarding pat. The clip has impressed Twitterati. Posted on Twitter just two hours before writing this, the video has been "liked" over 300 times already and retweeted at least 130 times. "Cute," tweets one person. "Happens only in India," tweets another. What do you think of Andaal's harmonica-playing skills? Let us know in the comments section below.